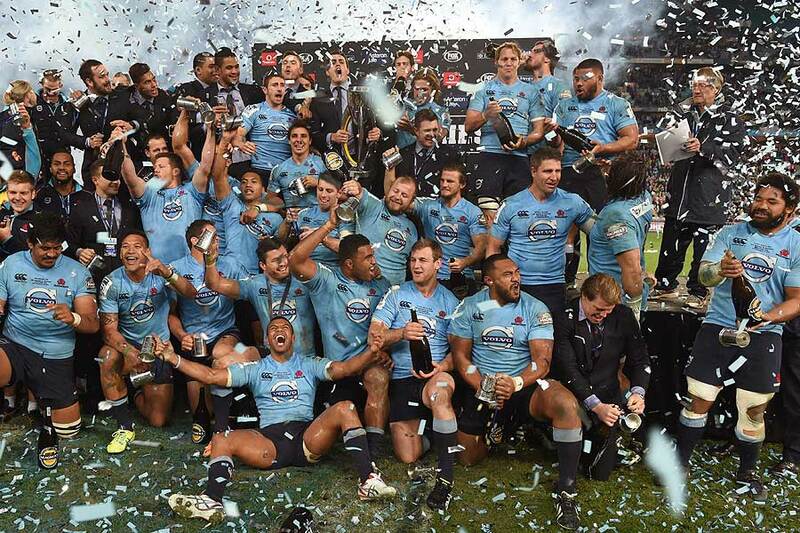 New South Wales Waratahs have claimed their first Super Rugby title in the most dramatic fashion, Bernard Foley kicking a 45-metre penalty goal in the final minute to secure a one-point margin over the seven-time champions. The Waratahs laid the platform with an outstanding opening quarter in which they secured a 14-0 margin at a point a minute, the Crusaders unable to get a foothold on the game as the hosts attacked with pace and precision. They continued to threaten on the flanks, and they looked to stretch the Crusaders at every opportunity with Rob Horne dangerous on the left wing and Israel Folau carving gaps with his broken-field running on the right inside Alofa Alofa, but they would cross only once again and their opening-quarter onslaught essentially proved the difference at the final whistle. 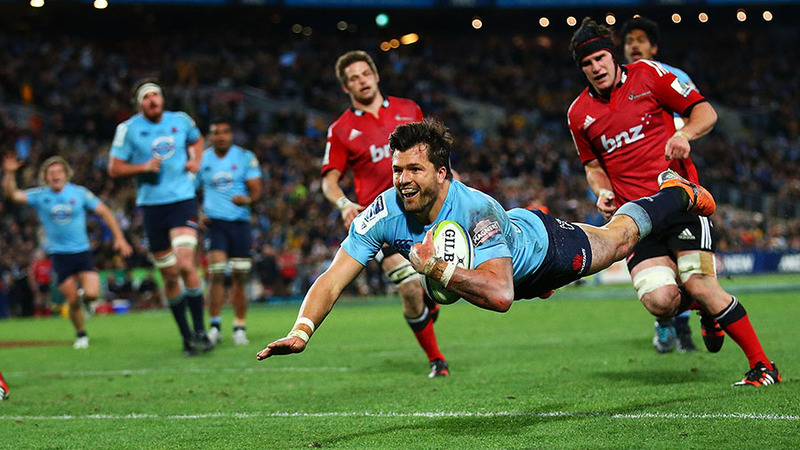 Man of the Match Adam Ashley-Cooper crashed through a gap to score the opening try of the game, off a short ball from Kurtley Beale, the second five-eighth involved meaningfully for the second time in phase play after the Tahs had secured the first lineout of the game. Foley missed the conversion but otherwise hit the visitors with three penalties awarded for ill-discipline at the breakdown. The Crusaders scored with virtually their first meaningful possession in Waratahs territory, Kieran Read roaming on the right to put Matt Todd into space and cross the line through a weak tackle from Ashley-Cooper for a converted try after Nemani Nadolo had stretched the defence on the left. But the Tahs hit back immediately through another penalty from Foley after Rob Horne for the third time had stretched Kieron Fonotia. 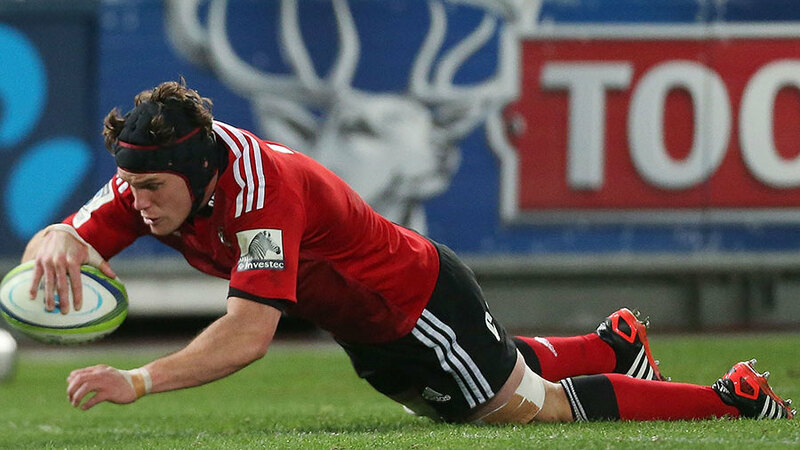 Colin Slade landed a penalty for the Crusaders, but the visitors then suffered a huge blow when Dan Carter left the field on the half-hour, the second five-eighth replaced by Tom Taylor after sustaining an ankle injury five minutes earlier launching a clearing defensive kick. Foley landed another penalty, awarded for offside, to extend the margin back to a converted try at half-time. 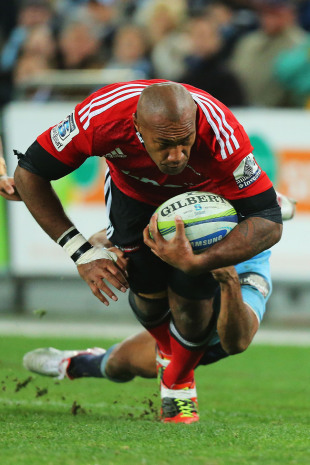 The Crusaders opened the scoring two minutes into the second half, after brilliant interplay through the middle before a looping pass put Nadolo into space with what seemed like a clear run to the tryline, but the winger only just got the touchdown when he juggled the ball in a desparate tackle from Beale. Tatafu Polota-Nau left the field injured shortly after half-time, and the Tahs seemed momentarily to lose the parity they had gained up front with Sekope Kepu coming under increasing pressure at the scrum - the prop penalised twice in as many minutes for collapsing the set-piece, and Colin Slade kicked a goal from the second offence to put the Crusaders ahead for the first time in the game, 23-20. The Tahs had the opportunity to hit back immediately, after Nadolo had been penalised for a high tackle on Alofa Alofa, but Foley missed his first penalty kick of the game only to be handed another opportunity straight away, which he landed, when Richie McCaw was penalised for offside. The Crusaders then regained the lead though Slade, from a penalty kick awarded for a high tackle on the 10-metre line straight in front. 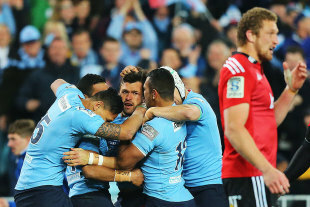 The Waratahs continued to attack with width and they gained their reward when Ashley-Cooper scored his second try of the match, the centre crashing through weak defence after they had stretched the defence left and right before going up the guts and then putting the ball through hands to the left. Nadolo looked likely to score his second try of the game when put into space with seven minutes to play, but Nick Phipps hauled him down after the behemoth had beaten Waratahs substitute Peter Betham; Phipps' good work was undone when the Tahs were penalised for being offside in the next phase, and Slade slotted another goal from in front to put the Crusaders two points to the good and the Tahs, seemingly, were set for their third loss in as many finals against the Kiwis. But McCaw, to the unbridled joy of the home crowd, was penalised for joining a ruck from the side, and Foley was handed his opportunity to make history in front of a Super Rugby-record crowd of 61,823 spectators. Foley told Fox Sports the reality of his match-winning penalty hadn't quite kicked in yet. "It's very surreal, it definitely hasn't sunk in yet," he said. "To do that tonight with this group of guys ... it's a dream come true. It [the kick] was right on my borderline. There wasn't much left in it and I had to give it everything I had and I think the rugby gods were smiling because it just snuck over. We've been working on trying to get a bit more distance into my kick. Normally KB [Kurtley Beale] takes the kicks when they're over 40m but I was hitting them well and though I just had to give it everything. To win it like that is a dream come true and as I said, it hasn't sunk in at all." It probably gets used way too liberally, but that was genuinely one of the great Finals. Sensational game @NSWWaratahs & @crusadersrugby..
New South Wales captain Michael Hooper praised his squad's effort and adaptability but admitted he initially thought Foley's match-winning strike had missed the target. "Their [the Crusaders] back-row were so tough," he said. "The set-piece went well for as at one point and then went the other way in the second half so we had to adapt. We adapted well and ground out that win. Last year we had a kick to win it over there and this year Bernie [Bernard Foley] takes the kick and, mate, I thought it went under but it went over and I was ecstatic. To seal out the game was monumental. You know you've done a good job when you beat a side like that in the final. All credit to them because they kept coming for the full 80 and that was one of the toughest 80 minutes I've been involved with. I'm so proud." Read was gallant in defeat, praising the Waratahs and thanking the Crusaders fans for their support. "Right now I'm gutted, the whole team is," he said. "We didn't come here for this result but you've got to give full credit to New South Wales. When you give them a lead like that it's very hard to run down. Everyone in the Crusader region really got behind us and we're gutted right now, but really pleased with the effort we put in." "We didn't quite handle the pressure early on and let them get a roll on and do what they're good at. It was just about us getting our hands on the ball and imparting a bit of our pressure on the game and we managed to do that. I felt in the second half we controlled it and they probably had that one opportunity and they did really well to take it."